You will receive 24 rubber Jingle Bell Bracelets - 12 red and 12 green. 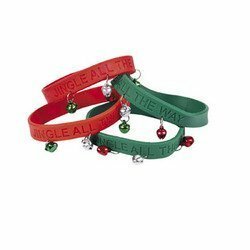 Each bracelet has three metal jingle bells and is imprinted with the words "Jingle All The Way"
Twenty-four Festive Jingle Bell Bracelets! The jingle bells are quite small and make a very gently jingly sound only. Imprinted with "JINGLE ALL THE WAY", these rubber bracelets have metal jingle bells.